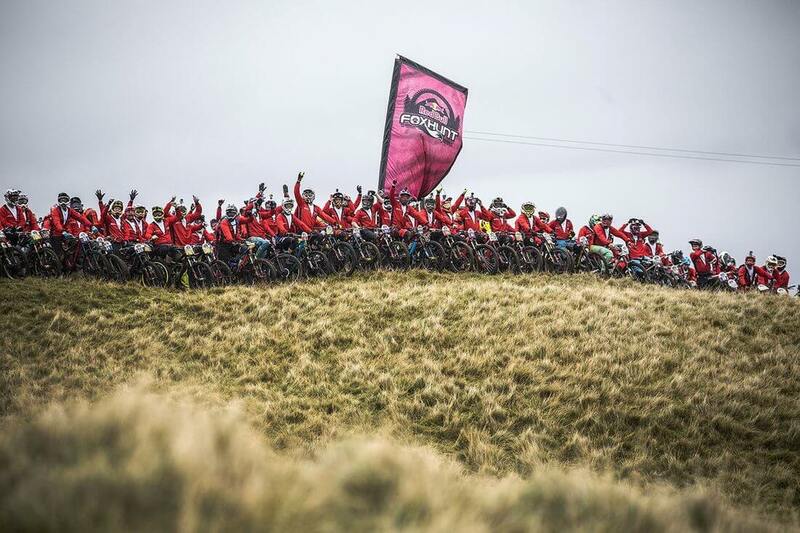 This was my third year to race the Redbull Foxhunt and am delighted to have kept my winning streak and finish first woman down! It was, by far, the most epic of them all! Not only were the jumps bigger and the track gnarlier, the rain the night before had made it even greasier than the day before which made for a very entertaining race! From start to finish, it was just brilliant craic! Every year we’ve been chased down the hill by the Fantastic Mr.Fox, Gee Atherton, but this year we had not one but three foxes! Local legend Colin Ross and World Cup Champion Loic Bruni! Back at the race village, the atmosphere was electric with people and bikes everywhere, Dave Bullet on the mike entertaining the masses, the media crew buzzing around the Pro riders who in turn were busy chatting to the public, all keen to get their selfie taken with the legends! With the excitement building the morning of the race, and that itch to get going, I was in the queue for the first uplift and headed for the top of the hill, right to where the race would be starting. The hill was thick with mist as I pushed and peddled my way up the single track, keeping my eyes peeled for sneaky lines off the main trail, looking for shortcuts to avoid the masses and bottlenecks….not exactly the easiest thing to achieve! When I finally arrived at the top, I realised it was just me, myself and a few sheep! Not a soul to be seen! I took in the views of Slieve Bloom during the brief intervals of the mist clearing, picked my route and let her go. The track was noticeably greasier than the qualifying race the day before, with more exposed rocks on the top sections and just general slickness. I made it down, sticking pretty much to the same lines as the seeding run. A couple of hours later, and I was back on the hill, this time amongst a sea of red and feeling a very different vibe to just a few hours ago! There was excitement in the air as we lined up in our rows, ready for the Huntsman to sound the bugle and for the carnage to commence! After the drone zipped past us, we cheered as the bugle sounded and roared our way down the hill, avoiding bog holes, fallen riders and bikes! I had a great start, sticking to my line to the right of the hill, but when I saw the carnage at the bridge, I decided to hop the barbed wire fence, run my bike through the ditch and trudge along the long grassy bog, passing riders on the single track as I ploughed my way through. I somehow managed to make it back onto the single track without crashing into the riders coming through and hopped back onto my bike. My goggles had fogged up so much that I had to just race without them, sometime one-eyed which didn’t help the cause! Squeezing and elbowing my way past riders, cutting onto the grass, I turned left off the main track through the bog just by the wooden bridges and did my best not to get caught up in the carnage here where many riders were experiencing comical ‘ham’ moments! There were riders and even bikes literally flying through the air in front of me! Once through this section and the bottleneck of the singletrack, I opened it up on the top downhill track, hitting the jumps while trying to avoid crashing into riders, making some seriously hairy overtaking! Instead of following the more technical track through the woods which I had done all day for practice, I took the easier track to the left and cut through the turns, straight lining the track. There were so many close calls with oncoming riders it was insane! By now the adrenaline was pumping and I was in serious race mode! Back onto the track at Hecklers rock, I could hear the crowds roaring and oohing as I was almost taken out while hitting a jump at the same time as another rider, both of us landing in unison into a berm a little less than perfectly! With my eyes on the prize and it was every man and woman for themselves right to the finish line! It was just an epic race and overall brilliant weekend. I don’t think there were many who didn’t have an absolute blast and want to go up and do it all again!